Gold, silver and platinum futures finished higher Tuesday following sharp losses on Monday. Gold and silver each advanced 0.7%. Rebounding from a more than one-month low and posting its first gain in four sessions, gold for June delivery rose $9 to settle at $1,333 an ounce on the Comex division of the New York Mercantile Exchange. "The dollar has been a driving force as of late. We’ve been seeing a little weakness in equities today, too," Reuters quoted David Meger, director of metals trading at High Ridge Futures in Chicago. 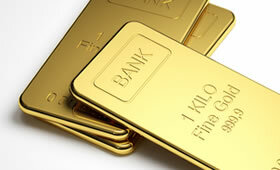 Gold futures ranged from a low of $1,323.60 to a high of $1,334.50. They dropped 1.1% in starting the trading week on Monday, marking their lowest close since March 21. Silver for May delivery added 11.6 cents to end at $16.703 an ounce. Silver futures traded between $16.53 and $16.74. They sank 3.4% on Monday. July platinum gained $12.60, or 1.4%, to $935 an ounce, ranging from $918.60 to $937.70. Palladium for June delivery lost $7.90, or 0.8%, to $971.65 an ounce, trading between $955.75 and $980.90. Really no new, news here, accept *platinum has risen! 1.1/4% & some what holding.